The combination of potato and sweet purple yam will be a unique combination of modern and traditional cake. 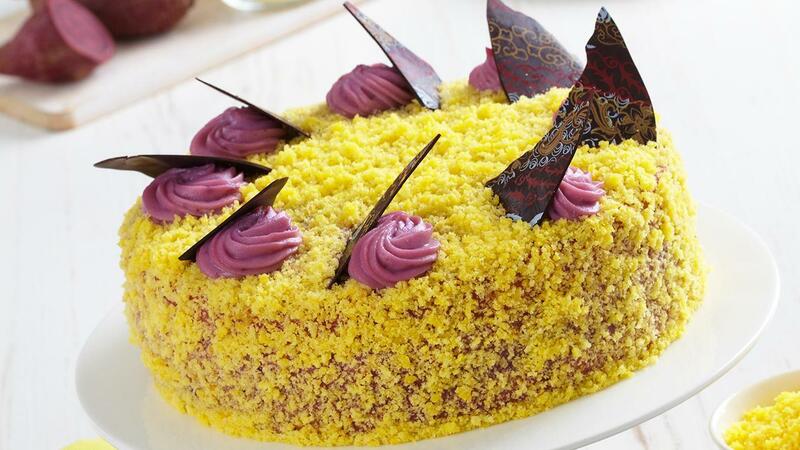 The potato taste combine with sweetness of purple yam make this cake very unique. Tempting taste for the flavour explorers. Heat milk until it bubbles up, add Knorr Mashed Potato, and stir them evenly. Add yam paste, custard, and simple syrup—stir them evenly. Whisk eggs, sugar, and cake stabilizer for a while, and then add all dry ingredients. Whisk them until they expand. Add melted margarine, stir them until they’re mixed evenly. Place the mixture into three 20 cm rounded moulds and bake them on 180° C temperature until they’re well done. Once they’re cooled off, garnish them with cream and sprinkle their sides using vanilla cake crumbs.